For some homeowners, it might seem challenging to find or create something that is both practical and luxurious at the same time, but believe it or not, there are still plenty of options that actually prioritize both. 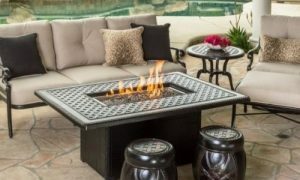 If you are finding for new ways to spruce up your backyard patio with a cozy and luxurious fire pit, then you have come to the right place! 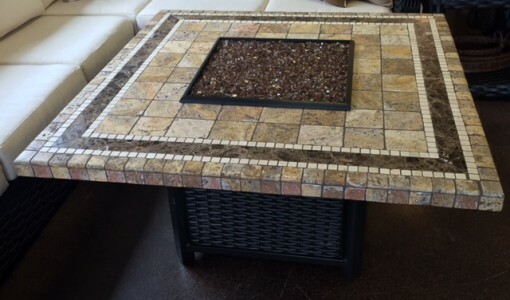 Can you just imagine having this beautiful piece on your outdoor living space? Not only will it add more aesthetic value to your outdoor area, but it will also provide great warmth and comfort to your family and guests! Since it is made of cast aluminum, you have the assurance that it will last for years to come! 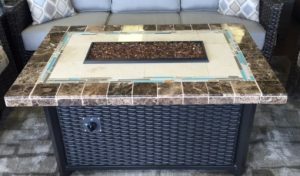 If you are looking for something that is more tropical in appearance, or if you want to have that tropical-feel for your backyard or patio, then this fire table will surely be a great addition to your outdoor living space! 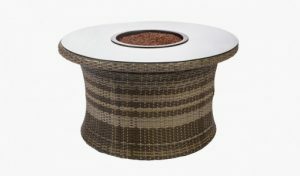 Made from high quality wicker, this fire table can be left outside all-year round! You do not have to worry about having to store it away in certain seasons – and it is also very durable! Make sure to check this out today! 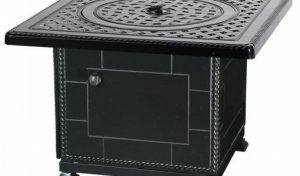 Here is another fire table that is made from high-quality cast aluminum. 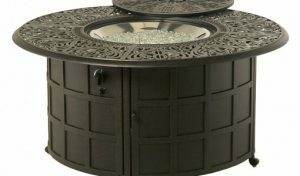 This fire table is best for homeowners who would like to add a touch of masculinity in their outdoor living area. With its edges and dark tones, this fire table is best for those nights of drinking wine or beer with friends, while at the same time, keeping warm and cozy around the fire. Still from our Grand Terrace collection, this fire table top is definitely a big hit for those homeowners who love to have luxurious outdoor furniture displayed on their outdoor living space. Ideal for parties or those intimate moments, this fire table can definitely bring such joy with its offered warmth and its gorgeous appeal! So, for your next outdoor party, make sure you have this ready for all your guests to use and see! If you have a more particular design in mind – no worries! Here at Palm Casual, we also offer custom fire tables! In the above photo, you can see one of the samples of our custom fire tables. So, get the perfect fire table for your outdoor living area – no matter what look you are going for! Check out our available fire tables today or you can just visit one of our factories today! We hope to see you soon!